More databases, more systems, more apps, more processes. All this ''more'' can weigh down every department in your organization if you don't handle it right. In 2008, there were already more things connected to the internet than people, and some estimates put the number of internet-connected things at more than 50 billion by 2020. More connected things means that big data will get even bigger. More databases, more systems, more apps, more processes. All of this “more” can create silos and slow sales cycles and weigh down every department in your organization from finance to support. Is your business ready to tackle this digital revolution? The biggest challenge of the digital revolution is connection, and the biggest challenge of connectivity is scale; not scale like you may be thinking, as in the millions more records you have to move or the explosion of endpoints, but rather how many people within your organization can build integrations. With thousands of connections needing to be built, highly trained integration developers have become the bottleneck. The trick is to empower non-technical employees who best understand the processes and the data to build the integrations themselves, not just once but many times over as their tools and needs evolve. For a long time, integration has meant many-to-many connections on cumbersome ESB or complex system-oriented architectures that required months to years of planning, testing, deployment, and maintenance. The nature of modern integrations is very different. Think PLM to Slack, Salesforce to Shopify, Magento or ZenDesk. IT departments still need to do heavy enterprise orchestrations, but these lightweight productivity integrations don’t have to exhaust IT resources and time like they used to. How do you take something that’s traditionally complicated and difficult and enable the scale out across thousands of users in a governable way? Agile iPaaS solutions that scale out, not up can provide intuitive, self-service integration capabilities to end-users and can still manage complex integration processes—all on one enterprise platform. Self-service integration capabilities couldn’t have come at a better time. Who procures and uses technology is quickly becoming decentralized outside of IT. A more diverse set of users requires access to the tremendous amount of data and systems necessary to acquire new customers and keep existing ones. For instance, more than 70 percent of the users that took part in the 2016 State of Salesforce Connectivity survey said the operating department (i.e., marketing, sales, or accounting) made or influenced the buying decisions for new software. 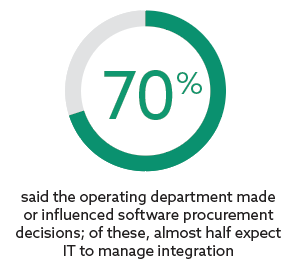 Yet, 43 percent of these organizations also expect IT to own the responsibility for integrating their apps. Allowing a business analyst or marketing manager to build integrations themselves means greater returns on IT investments and deeper insights that will lead to better business decisions sooner. All of the “more” mentioned above happens fast and changes fast. Speed is the currency of the digital age. Connections between all of those new devices, databases, systems, apps, processes, people and devices must be built in days or hours. It’s simply not practical for integration projects to take months or years anymore. Speed needs to extend beyond the first connection, too, because internal demands and customer expectations are also constantly changing. How fast your organization can build incremental integrations to deliver modern, Agile, and compelling customer experiences will determine whether you win or lose in this digital revolution. What else will help you win in the new digital world? Download the 2016 State of Salesforce Connectivity report to find out! Scaling Integration: Let's Rethink How We Work! Published at DZone with permission of Megan Dobransky , DZone MVB. See the original article here.